By claiming to be ‘taking a stand’ for Soros-funded #BlackLivesMatter, Colin Kaepernick may have only been looking out for himself. Up until Saturday morning, with the exception of NFL fans and ESPN watchers, many Americans had never heard of San Francisco’s #2 quarterback and multi-millionaire Colin Kaepernick. However, as news traveled across the airwaves and internet after Mr. Kaepernick refused to stand for the National Anthem during Friday night’s pre-season game, it seems he has become very well known. Whether or not it is or is not Mr. Kaepernick’s “right” to refuse to stand during the National Anthem (it is his right, by the way), is almost beside the point. Rather, it is Mr. Kaepernick’s statement that America is “oppressive” and his siding with the Soros-funded anti-police astro-turf group Black Lives Matter that is laughable—especially given Mr. Kaepernick’s obvious lack of oppression. Colin Kaepernick signed a 6 year, $114,000,000 contract with the San Francisco 49ers, including a $12,328,766 signing bonus, $61,000,000 guaranteed, and an average annual salary of $19,000,000. In 2016, Kaepernick will earn a base salary of $11,900,000, a roster bonus of $2,000,000 and a workout bonus of $400,000. Kaepernick has a cap hit of $15,890,753 while his dead money value is $19,697,260. Kaepernick says he is “proud” to stand up for his beliefs, even if he is dropped from the 49ers or his sponsors leave him. Although, according to sports writer Vinnie Iyer, Kaepernick is on “thin ice” with the 49ers, his conclusion that Kaepernick “just put his future with the team on a lot thinner ice” is likely wrong. In an interview earlier this week, he suggested that his relationship with San Francisco’s general manager, Trent Baalke, was stone cold. Kaepernick just put his future with the team on a lot thinner ice after making the organization and the higher-ups even less happy with him. 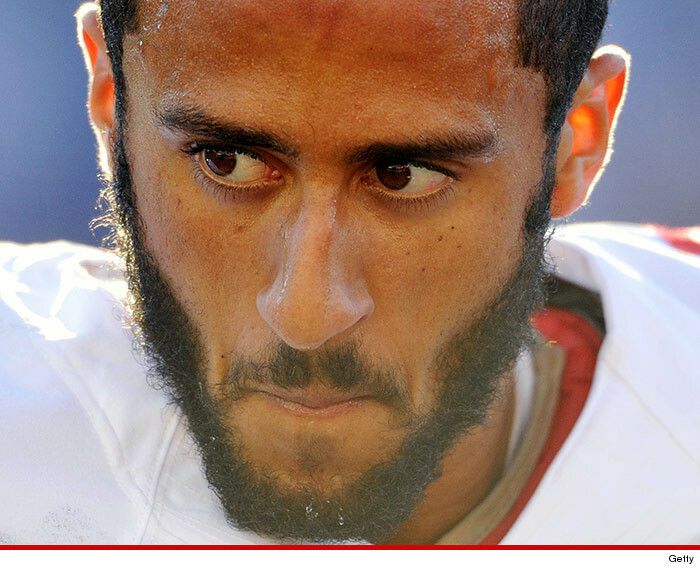 It is doubtful that either the 49ers or his sponsors will drop Kaepernick. By his putting himself in the center of a race-based controversy makes it more difficult for either his sponsors or the 49ers to drop Colin Kaepernick…at least for the time being. Perhaps that is what Mr. Kaepernick planned all along? Meanwhile, expectedly, there has been a fairly substantial backlash on talk radio and the internet. I don't believe #ColinKaepernick is genuine. He's a pouty, malcontent, trying to force a trade. Could've taken a "stand" much sooner. https://t.co/68WCTWCH9d He has no "right" to do this while employed by 49ers. Make him stand or cut him for conduct detrimental to the team.